Note: Due to weak broadband connections, pictures were not posted on the Halstead to Cassoday post until today. If you read a post and there are no pictures, check the post again within 1-2 days for pictures and additional text. 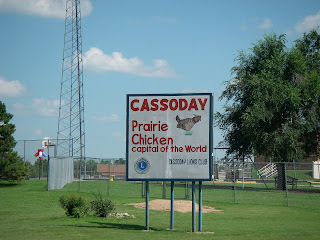 After leaving the world renowned town of Cassoday on Wednesday, we traveled south on a county road into a headwind to Rosalia. In Rosalia there was a restaurant called The Old Hat where we stopped for lunch. The proprietress brought out the guest register for us to sign. This was a log of all the cyclists who have stopped there since 1992. It was really neat to the see the names of cyclists we have met on the road. After Rosalia we turned east again and were on U.S. Hwy 54 and had a southwest tailwind. We rode through a rolling landscape with creeks and wooded areas until we crossed the Verdigris River where we turned south on Kansas 105 to Toronto. 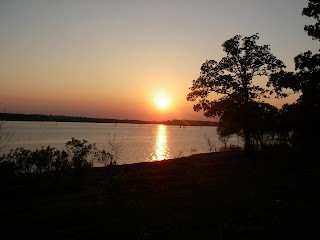 We camped at Cross Timbers State Park near the bathhouse at the swimming beach. We had one of the best showers of the trip at the bathhouse. We were hot and sweaty after 60 miles, the water was just the right temperature and the bathhouse was open to the air and the cool air felt divine. The sunset over the lake was a gorgeous end to a long day. This morning we headed south on Kansas 105 throught lovely rolling country in the floodplain of the Verdrigris River as it heads southeast through Kansas. We soon turned on a county road to connect us with Kansas 39. After so many miles in Kansas, we have come to realization that Kansans love to mow; every farm and every house has a lovely mowed yard and all the shoulders of the road are mowed. No matter how big the yard it is lovingly, neatly mowed. We have seen huge lots or areas around farmhouses perfectly mowed. Now we know where all those riding lawn mowers are sold. As we approach the Missouri border, we have also come to realize how many creeks, ponds, lakes and rivers we have seen. Southern Kansas is a fairly wet region, much wetter than we thought. 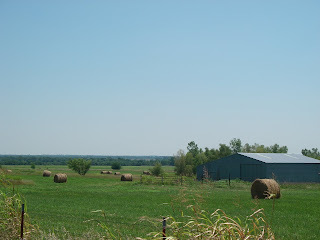 Hay baling is in full swing in southeastern Kansas and we have ridden many miles with the following view. A county road brought us into Chanute and we will continue south tomorrow on another county road as the adventure continues.